Wulfrik the Wanderer, also known as the World Walker and the Eternal Challenger, is a devout and relentless follower of Chaos. He roams land and sea, a monumental figure encased in black steel armour adorned with the skulls of his many kills. He lives to fight, and makes offerings of his defeated enemies, dedicating their deaths to the Dark Gods he serves. To aid in his cursed quest, he took the magical longship, Seafang, from the Chaos Sorceress Baga Yar. Powered by blood and driven by daemons, Seafang can travel through any Realm, even harnessing the Winds of Magic themselves. 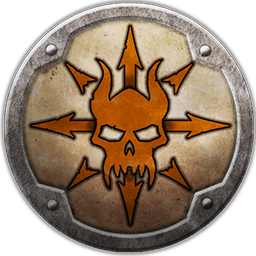 In search of new foes to fight Wulfrik has journeyed from the deserts of the Tomb Kings to the holds of the Dwarfen Lords and the isle of the High Elves. This executioner of the Gods has killed Dragons and Kings, Undead Lords and Chaos-warped Trolls, all in the cause of appeasing the Ruinous Powers. None may refuse the challenge he delivers in their own tongue, and once he has fixed on a foe, that foe will not escape him.